It is sometimes funny to hear people talk as though Ohimai is the first young person to join PDP. Several young people have joined the party in the past. People with proven track records had joined the PDP and got swallowed by the depth of sleaze therein. Tony Nwoye, former NANS president was the PDP Chairman in Anambra while Chris Uba, another young PDP member, unleashed full-scale brigandage in the state. The first speaker of House of Representatives, Mr Buhari, was less than 40 then. Dimeji Bankole, with good education and the requisite carriage for public service, is still alive today. We all know his story. Herman Hembe isn’t an old man. We know his story. Have we bothered to ask ourselves why Ngozi Okonjo-Iweala, the towering economist from World Bank, has been reduced to a regular Nigerian politician, impotent and unable to deliver visible results? Recall that many of us begged her to accept the offer to serve as a minister. And when she did come, we were excited. Today what is her rating in the public domain? Was it not in her presence that a budget of N1 billion – the salary of the United States president for two and half years – was prepared for the feeding of just two men? Who remembers that Olusegun Aganga was once Managing Director in Goldman Sachs, a corporation known to reward performance and excellence? He didn’t ascend to that height by being a mediocre; he did by merit. Today he is a minister in Nigeria, and can only put up a mediocre performance. He has nothing to show for his giddy rise in Goldman Sachs. And often times I get to ask, as if to get reassured, if Aganga is still in this administration. How about professor Barth Nnaji? The darkness in your house should remind you that the PDP rot has eaten his past and reduced him. Who remembers Reuben Abati of the Guardian? Is he the same Abati of today? Hime defenders then (I doubt he still has any now) told us he joined to change the system. The system has transformed him a classless sycophant, constantly talking from the two sides of his mouth. Ohimai cannot change PDP; PDP will change Ohimai. He will either be appointed the head of ballot-box snatchers or cult boys recruitment. Yet, he will not leave because the compensation system has been designed to attract any, and every, mind that has not given money its place in their lives. I don’t know if Ohimai has. So how do I think the system can be changed? Just like Ohimai, I am convinced that the system can’t be changed from the sidelines. I have often said that activists cannot change Nigeria, only those who go into politics can. But unlike him, I don’t believe anybody can save Nigeria by joining the PDP. The PDP cannot change Nigeria. 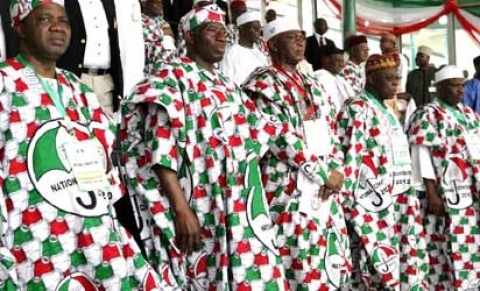 There’s no place in the world where 13 years is considered short to make a remarkable impact in a polity as a ruling party; yet our thirteen years have been blown away by the greed and avarice of PDP. If we consider the opposition parties too sectionalised, then we must, as people serious with our quest for change, build an alternative party with national coverage, and then begin from day one to imbibe in members the tenets of true democracy. Let us, including Ohimai, roll our sleeves and get to work. We can build a new national party that will thrive on the power of the people, not on money or brigandage or rigging or godfatherism. PDP isn’t a great party, and Ohimai knows this. In fact, it isn’t even a political party to begin with. It remains, as the American government described it in a 2007 diplomatic cable leaked to Wikileaks, “an agglomeration of interest groups formed around persons of prominence and power which are loosely tied together by a desire to remain in office and maintain access to the ‘national cake’ or resources of the state”. She added that the party has no “ideological consensus” whatsoever and had remained divided from the start. Ohimai Amaize only chose to become a part of that opportunistic coalition of interests. And as he works hard towards remaining in power and accessing the ‘national cake’ which is the overriding desire that loosely ties PDP members together, I do, from the depth of my heart, wish him well. Jealousy, I guess U̶̲̥̅̊ wished you were there. A large number of us are screaming at the fact that he joined PDP. Would it have stirred the waters more if he had chosen any of the other two(ACN,CPC)parties? If we the youth already have it in mind that it had to be for finacial reasons he joined PDP,I wonder who we can trust? He wants to pursue his political ambition and he has choosen a platform,let's encourage him and see what comes out of his decision. Ohimai,we are all watching you. It was well captured, bro. Obviously, he prefers it ready-made. Little wonder he never joined the party he campaigned for the presidential candidate. He probably did the campaign not believing in the cause, but hoping to bring himself to limelight and brag as the youngest to have done that. It's good, tho, that we can see his true colour early enough. I hope God exposes all of them disguising as change activists. Is there a way any angel can save the devil from hell? "Ohimai cannot change PDP; PDP will change Ohimai. He will either be appointed the head of ballot-box snatchers or cult boys recruitment. Yet, he will not leave because the compensation system has been designed to attract any, and every, mind that has not given money its place in their lives. I don’t know if Ohimai has." I thoroughly enjoyed your post Sir, but from the above quote called from your post, I can conclusively say that this is more of a post targeted on the subject than a post to showcase the failings of PDP. I still insist that personal integrity outweighs a polluted structure. Do check my timeline for today at http://www.twitter.com/blcompere for more details. Cheers! ekeke, nice piece as usual. ur points are clear but i disagree with some of them tho. PDP might not be a 'great' party going by achievements. looking at it from an angle of size, spread… it is a 'great' party. u mentioned people who according to u were 'changed' by PDP. was El rufai changed? was Ribadu changed? there are more +++ . No party in Nigeria has an ideology. Not ACN,not PDP, not CPC. from the PDP have come the good, the bad and the ugly. tho the bad has been more. we hv PDP govs doing relatively good. why do we think people make decisions because of monetary gains?? Ohimai's decision may not be palatable to so many people, but the truth be told, if we can never win unless we change the system. only minimal change can come from the outside. the real work must be done on the inside. one thing I know,PDP can be changed. I wish Ohimai the best tho. pls prove the doubters wrong. He never lets me down, a true Patriot and soldier in d frontline of d fight 4 d change we all desire…. @Ekekeee, well said bruv. Ohimai, you cannot change PDP. You are outnumbered by men 3 times your age that have no intention of budging.